There is yet to be a coined term for the exported English version of Americana, but if there was such a word it would still struggle to define the musical world of Police Dog Hogan. This London based octet have the opportunity to share their brand of unique familiarity at this year’s Americana Music Festival and the Nashville alt-elite will get an early opportunity to sample the wit, passion, eccentricity and unrelenting excellence of their new album WESTWARD HO!. 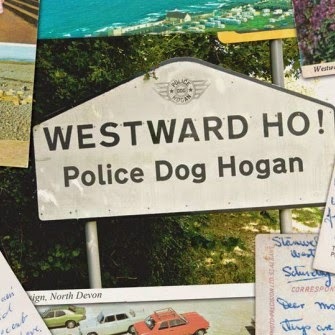 As far as steering their style into the blurred world of Americana music, Police Dog Hogan put the brakes on at the western extremes of the English seaside before sending a lyrical postcard to the world. The mass amalgamation of roots instrumentation has been core to Police Dog Hogan creating their own niche on the UK live circuit and on this their third studio album they have elevated the extension of the quality right across the release. The writing is clever, cutting, mature and full of quip merging well with a sound taking only an occasional breather. Lead singer and guitarist James Studholme has the strongest links with the geographical heart of the album which starts with the exploding chorus of the opener ‘Thunderheads’, hurtles along in the blistering haze of ‘West Country Boy’ and reminisces refreshing heartfelt honesty in the outstanding ‘Crackington’. Packed with memorable lines, acute observations and more than the occasional landmark namecheck, each song demonstrates the inner soul of the writing in a similar vein to the fiddle, banjo, mandolin and trumpet adding the finer touches to the musical arrangement. Three more bright and breezy songs present a sample of how good the band comes across on stage, whether at summer festivals or headline shows. The harmonica and mandolin sprinkled ‘One Size Fits All’ looks at some of life’s troubles from an egalitarian angle, while there is a definite Irish feel to the sparkling trumpet and fiddle infused ‘From the Land of Miracles’, confusingly also the title of Police Dog Hogan’s previous album. 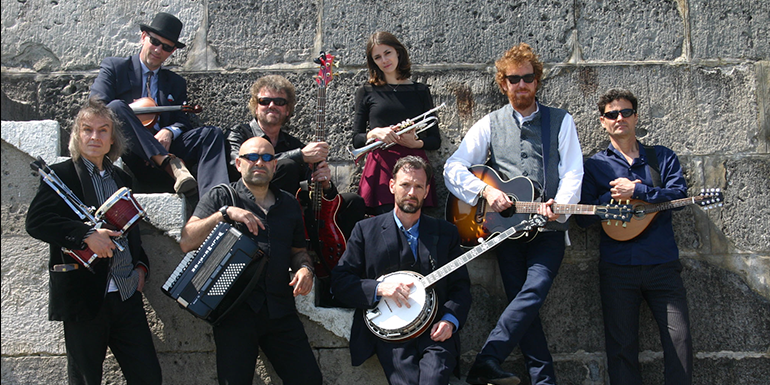 This lively trio is completed by a wander into gospel territory with the slightly tongue in cheek ‘Judgement Day’ and a tune driven along by blistering fiddle and banjo. For the personnel record, Police Dog Hogan comprise of seven ‘experienced gents’ and then divide their age in half to present trumpeter Emily Norris. Both their studio and stage existence sees a frivolous mask covering a band serious about making good time music mixed with some hard edged themes. The guys have teamed up with a group of ex-prisoners Platform 7 to record the track ‘Home’ and have taken an active interest in the Music in Prisons charity. On a lighter note, the world of footballer’s wives is explored in ‘No Wonder She Drinks’ and ‘A Man Needs a Shed’ is a self-explanatory gender centric track. ‘St. Lucie’s Day’ and ‘Buffalo’ represent the gentler side of an album which has benefitted enormously from the producing skills of the Oysterband’s Al Scott and a tie up with the increasingly influential label Union Music Store. In an album packed with a wealth of interesting anecdotes, references and themes, the final track to mention is ‘Ethan Frome’ which is based on a century old novel of the same name and adds a final shot of intrigue to a record expertly preserved for multiple listens. Police Dog Hogan now has a complete album to parade alongside their previous memorable songs and stirring live shows. WESTWARD HO! possesses a quintessential English charm and successfully takes Americana music on at its own game. Now we just need to search for a name to satisfy the genre junkies.